There’s still time to volunteer! The giving spirit of Ford Alumni and FSAA continues this year with Earth Day Celebrations. FSAA board member, Emilie Jensen (Ford Scholar, 2009), has created a new Earth Day Events page on Facebook where you can find all the existing and ongoing service projects. All FSAA members are encouraged to post projects that they are hosting, participating in or need volunteers for. You must be a member of the FSAA Facebook group to access the events link, so be sure to join! One of the projects is tree planting with Friends of Trees. They are aiming for about 5-10 volunteers. The event is on April 1, from 9:00 a.m. to 1:00 p.m., and is part of the Bee Stewards Wilsonville project at Memorial Park in Wilsonville. Snacks, tools and gloves will be provided. If you are interested in joining, please contact Emilie on our contact page! 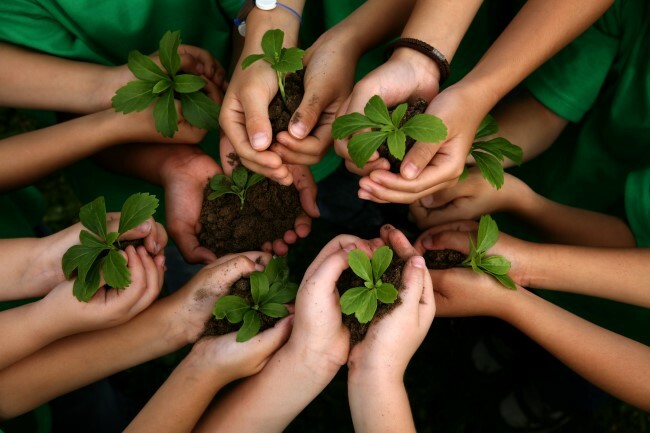 Interested in hosting your own Earth Day Service project and inviting other alumni? Contact Emilie on our contact page! Every year FSAA and Ford Alumni continue to show strong support for their communities. This year the weather couldn’t stop our members from giving their time and support to a variety of community organizations. As part of the Martin Luther King Holiday, members volunteered in Springfield to help organize, label, and curate student artwork for an exhibit in the Springfield High School cafeteria as part of their MLK Jr. Day Celebrations hosted at the school. Additionally, groups volunteered in Salem with an advocacy organization; and with a lunch making crew (via Metal Toad, a local Portland company) that made and distributed bagged lunches for the homeless in downtown Portland.